During tonight’s broadcast, in studio engineer Jim “Stumpy” Monroe came up with some words of wisdom (and not the words that the fans who watch the game on BoiseHawks.tv hear during the broadcast) that hopefully holds true. If you think about it – if the Hawks take nine of the next 12 series…they will have moved past the .500 mark on the season – and hopefully be closer than the six games they are back of Tri-City after tonight’s 9-5 loss. Speaking of tonight – fans had the opportunity to watch a rarity in 21st Century baseball, a knuckleball pitcher. Houston Summers had the 59 mph knuckler working, going two innings to pick up the win. I believe (I may be wrong) that only two pitchers currently in the MLB throw the pitch (Tim Wakefield and R.A. Dickey). Great to see Jordan Petraitis get a pair of hits to break out of his slump, while Greg Rohan continues to swing a hot bat with two more hits tonight – now eight hits in 15 at bats. THE BACON: The Hawks will load their bus at 6:30 a.m. in the morning, leaving for the four and a half hour trek to the Tri-Cities of Pasco, Kennewick, and Richland, Wash…Gesa Stadium is located in Pasco, the team hotel (Red Lion Columbia Center) is in Kennewick…the home run tonight by Clayton Conner for Yakima was the first at Memorial Stadium this season, while Jose Valdez extended his home hit streak to six with a single in the third. LOOKING TOWARDS THE BROADCAST: Tomorrow’s Hawk Talk will be a doozy – as we’ll have our first “Go Cubs Go” segment of 2009 (chatting with the other broadcasters from the Cubs minor league system), we will chat with Carrie Muskat of cubs.com, and will have our fantasy feature. Hawk Talk hits the airwaves just after 7 p.m. (MT), with first pitch from Gesa Stadium at 8:15. Northing jumpstarts a club more than a walk-off win, let alone a come-from-behind walk off victory in extra innings. For the Hawks tonight, a pitchers dual filled with missed opportunities turned into extra inning drama at Memorial Stadium – as Boise and Yakima played nine scoreless innings before the tenth was jammed full of excitement. The Bears loaded the bases in their half without an out – a double, a hit by pitch, and a walk, but reliever Ryan Sontag nearly tip-toed out of it, getting one of 16 K’s by the Hawks staff and a fielders choice out a home. However, Jorge Corniel took a pitch Sontag was trying to back-door on the outside edge and poked it down the right field line for a two-run double, giving the visitors the lead. walkoff.wma) – as the entire team mobbed around home plate in the celebration – including the guys in the bullpen. NOTES: The Boise Hawks, in conjunction with the Chicago Cubs, announced four roster moves following tonight’s game – as catcher/infielder John Contreras has been promoted to Advanced-A Daytona, catcher Matt Williams (18th Round out of Duke) and pitcher Corey Martin (26th Round out of Western Carolina) have been promoted from the Mesa Cubs, while first-baseman Sean Hoorelbeke was released. For Martin, he will be reunited with his former college teammate Brent Greer, a shortstop for Yakima, while for Hoorelbeke, he will look to begin his teaching career in Michigan, after earning his teaching certificate during the past off season. AROUND THE HORN: Former Hawk (’02) Ricky Nolasco allowed just two runs in eight innings last night, helping the Florida Marlins to a 4-2 win over Washington…former Hawks Casey Coleman (’08), Jay Jackson (’08), and Blake Lalli (’06) were named to the Southern League North Division all-star team, with Coleman picking up his eighth win of the season last night for Tennessee. I felt tonight like it was 2004 all over again – just as it was at the one-time only Northwest League All-Star Game to commemorate the 50th Anniversary of the league. That night, in the fourth inning of the game (after Ryan Harvey won the home run derby), the power went out at Avista Stadium – and never came back on, leaving then Yakima broadcaster Chad Goldberg to talk for 75 minutes before the game was postponed. Fast-forward to tonight, the first-ever minor league game managed by Hawks skipper, Casey Kopitzke. The lights were turned on at the park in the third inning, but I noticed they were off by the fifth. By the time the eighth inning rolled around – it was getting dark, still no lights. Luckily after a 17 minute delay, the 3/4 of the lights were on – allowing play to finish. According to Hawks groundskeeper Jeff Israel, something was overloading the power grid at the part, tripping the turn-off switch. He said that the electric company will be out in the morning. Speaking of the game – what a performance by the Hawks pitching staff, not allowing an earned run in the game. Jeff Antigua kept the Yakima batters off balance, with Dionis Nunez recording his second-straight quality appearance. Mike Perconte knuckled down in the ninth, getting the final three outs for the save. Despite two errors in the opening innings that allowed two runs to score, the Hawks defense was stellar – as Kevin Soto made a pair of diving catches in the outfield, while Greg Rohan made a nice diving snag of a grounder in the first inning. NOTES – Hak-Ju Lee saw his eight-game hit streak snapped, but reached base twice…the Hawks did not allow an earned run in the game, while holding their opponent to the fewest number of runs this season…Chicago Cubs vice president of player personnel, Oneri Fleita is in Boise to watch the three-game series…former Hawk, Garret Anderson hit his fourth HR of the season in Atlanta’s 2-1 win over Boston. After a tough 11-1 loss last night, things got off on the right foot for the Hawks – but quickly went downhill from there, as Boise saw their season opening record fall to 1-7 with a 12-3 loss at Salem-Keizer. As I write this from Caldwell, the team is just leaving Keizer for the eight-hour jaunt home, arriving at Memorial Stadium just after the sun rises in the morning. What they leave behind is a tough series in which they recorded 30 hits in five games – but allowed 31 hits by the Volcanoes in the final two games alone. Tonight, it was lost opportunities – as the Hawks grounded into four double plays, and if it weren’t for hustle by a couple men, it could have been six. Boise jumped out to a quick 2-0 lead, as starter Javier Hernandez could not find the zone – walking four men, including two with the bases loaded, but Miguel Sierra and Danny Keefe could not hold the lead, allowing a combined ten runs in three innings of work. On the positive side, great to see Greg Rohan get a pair of base hits – not including a ball he ripped into the left-field corner foul in the first inning, while both Jose Valdez and Hak-Ju Lee added two hits apiece, with Lee extending his hit streak to eight. THE BACON: Pitching coach David Rosario has tweaked the piggy-back rotation for the next three nights, as Robert Whitenack will make his first professional start tomorrow night against Yakima, with Larry Suarez throwing Monday, and Jon Nagel on Tuesday…Jeff Antigua will be the back-end of the piggy-back tomorrow, Tarlandus Mitchell on Monday, and Josh Whitlock, Tuesday. ROSTER MOVE: The Chicago Cubs have announced that Joe Simokaitis has been promoted from rookie ball in Mesa to the Hawks…Simokaitis, a tenth-round pick in 2005 out of Nebraska, is a converted pitcher, after advancing as high as AAA as a shortstop…the Hawks will now have four converted pitchers among their 17 pitchers. HISTORY: The 1-7 start by the Hawks is not the worst in franchise history, as the 2006 team began 2-9 and the 2007 squad went 0-9, eventually 1-11…however, the 2006 team won the Eastern Division pennant and the 2007 squad was in the pennant chase up until the final week. It was 2 a.m. in the morning and I was waiting for a cab in the lobby of the Comfort Suites in Salem – on my way back to the Treasure Valley to take care of my son P.J., flying home on the 25th Anniversary Horizon Air jet. As long as my day ended up – it mirrored that of the Hawks, as Jorge Bucardo and two relievers limited Boise to just two hits in an 11-1 loss. homerun2.wma). But that was all the Hawks would get – as the pen allowed seven runs in the final three frames. A BIG THANK YOU: Special kudos to Tod Pickett for filling in for me tonight and tomorrow, along with Salem-Keizer radio man Mark Gilman for providing equipment for us (including the monitor for me in the booth this week) – both are true professionals and a pair of the nicest guys in the business. THE BACON: The second hit by the Hawks was a double by Hak-Ju Lee in the sixth, extending his hitting streak to seven games. At the major league level, former Hawk Randy Wells picked up the victory as the Cubs topped the White Sox, 5-4, with another former Boise player, Geovany Soto, hitting the go-ahead three-run homer…former Hawk, Josh Vitters, was selected to play in this year’s Futures Game at Busch Stadium in St. Louis, the Sunday before the All-Star Game. STRANGE BREW: The Hawks were victimized by a pair of weird outs on Friday night, as Alvaro Sosa was called out on a ball that looked as if it hit his foot, however, after the catcher tossed the ball back to the pitcher, all realized that Brett Terry, the plate umpire ruled the ball in play, with the out finally recorded at first…another play saw Jose Valdez called out for stepping on home plate when trying to bunt the ball. Fly the Flag, Hawks Win / What is Crater? I could hear the late Harry Caray in my mind – “Cubs Win, Cubs Win” or Ron Santo saying, “Yes” after tonight’s game, as the Hawks rallied from a 4-1 deficit in the final two innings to pull out a 5-4 win over Salem-Keizer. homerun.wma) to tie the score, then Jae-Hoon Ha chopped an RBI double to left to score Matt Cerda with the winning run. The mood of the team was upbeat after the game – especially Rohan, who had been robbed a pair of times earlier this year of hits. He will join me on Hawk Talk tomorrow to talk about his time in Boise and about the home run. A SLICE FROM KEIZER – Boise fans, you make the call on who has the better mascot – our Humphrey the Hawk or Salem-Keizer’s Crater (see video). Honestly, I don’t know what Crater is? HEADED HOME EARLY – My time in the Willamette Valley has been cut short due to a family situation back home, as I will be returning to Boise early Friday morning – but will be on the air Friday night for Hawk Talk (J Bates and Will Hoenike will join us for an Around the Horn segment and will chat with Don Larsen about his perfect game in the World Series). Longtime Fox Sports broadcaster Tod Pickett will have the Play-by-Play on Friday and Saturday night – while I’ll be back in the saddle on Sunday at Memorial Stadium. For the first time in five games, the Boise Hawks bullpen was outstanding – allowing just one hit over nearly seven innings of work, however, that one hit was a two-run home run, as Salem-Keizer extended the Hawks season-opening losing streak to five games with a 5-3 win. There was a very intimate crowd at Volcanoes Stadium, as the crowd was announced at just over 2,200 – but you be the judge as this video shows how many fans were in the ballpark during the national anthem. Cliff Andersen was the story offensively, knocking in three runs – two on a first inning double, but Boise did not get a runner to second base in the final four innings. Really impressed by Robert Whitenack, the Division III draft pick out of SUNY-Old Westbury, who used his knuckle curve and a solid fastball to retire all six men he faced. THE BACON: To the left is the den of the broadcaster on the road – the desk in the hotel room. 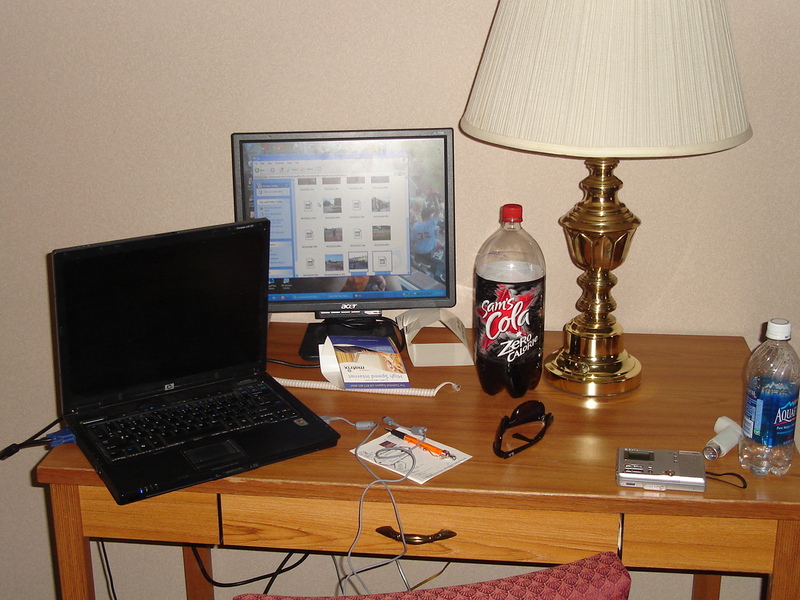 Since my laptop monitor is dead, I have to bring another screen with me, plus with my diet – you notice it is diet soda there (went with the Walmart brand since it was 59 cents – sorry Pepsi) and the bottle of water has been refilled countless times. Went to the gym with the team for the mandatory workout – something I have never done in my years with the club. My wife and I are on a major diet and working out is something we consider a priority right now, so I am going to take every advantage I can on the road. After 20 minutes of row machine, a 15 minute jog and a 15 minute walk, I watched something hillarious, as Jae-Hoon Ha and Tarlandus Mitchell were playing racquetball in a court below – neither knowing the facets of the game. Those who had finished their workouts were huddled around the court – it was REALLY funny. After the game, I accompanied the team to Applebee’s for dinner – for me, it was a small salad, unlike in the past, which it would have been a full order of nachos, some mozzarella stick, and some beer. The mood of the team is upbeat, although the losing is beginning to wear on some of the players – especially the veterans. NEWS: Carrie Muskat of cubs.com has reported that Brett Jackson, the Cubs first-round pick, has signed and following a physical, will report to Boise to begin his professional career. It would mark the sixth-straight year that a first-round pick has been assigned to Boise (2004 Ryan Harvey/Lou Montanez/Luke Hagerty, 2005 Mark Pawelek/Luke Hagerty, 2006 Mark Pawelek/Tyler Colvin, 2007 Mark Pawelek/Josh Vitters/Kyler Burke, 2008 Mark Pawelek/Josh Vitters/Kyler Burke/Andrew Cashner/Ryan Flaherty). SIGNINGS: With the signing of Brett Jackson, it marks 13 official signings by the Cubs – including the four players (Whitenack, Petraitis, Rohan, Keefe) with the Hawks (although Jackson is the only one that the Cubs have announced)…others include Wes Darvill (5th round), Charles Thomas (10th), John Mincone (11th), Cody Shields (15th), Matt Williams (18th), DJ Fitzgerald (22nd), Justin Bour (25th), and Tim Clubb (29th) – who are all in the Arizona Rookie League. One day in the books in the capital city of Oregon and another loss in the books for the Boise Hawks, as Salem-Keizer claimed a 6-1 victory tonight. The Hawks were stymied by three Volcanoes pitchers, with Sean Hoorelbeke the only player to have a multi hit game. 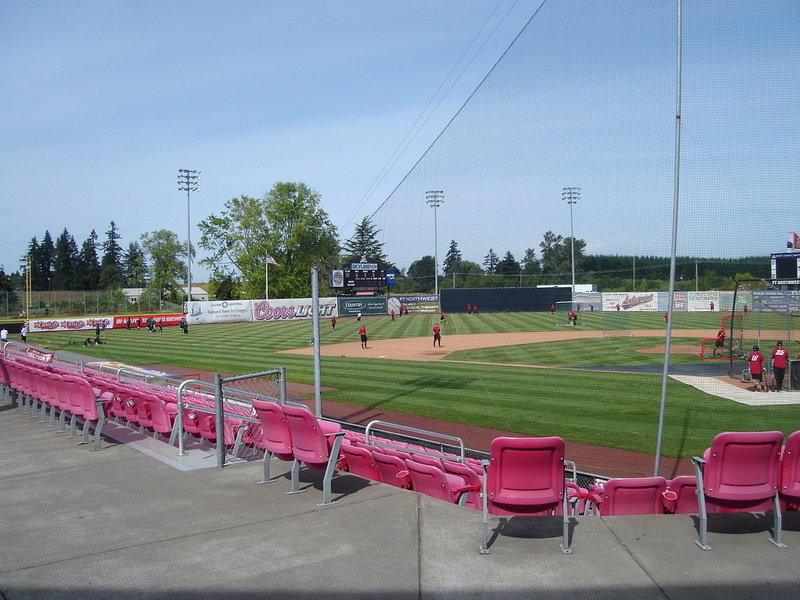 The team got to test out Volcanoes Stadium (left), the only park in the league with a chain link outfield fence. Jeff Antigua was solid in his Boise debut, allowing just a two-run home run in four innings of work, walking two and striking out four. However, the bats were silent – despite a good round of BP (including this video of Jae-Hoon Ha) by the team. For the first time this season, Boise relievers were able to make appearances without allowing a run, as Ryan Sontag got four outs and Mike Perconte got three outs to close the game. Another negative that I heard about after the game was from catcher Matt Cerda, who’s parents were at the game, but forced to watch the game from an outfield berm (video of the park shows the berm beyond the short fence in left field) – as despite a crowd of 2,724 (well below capacity), they were not given a seat in the park (unless they bought one). 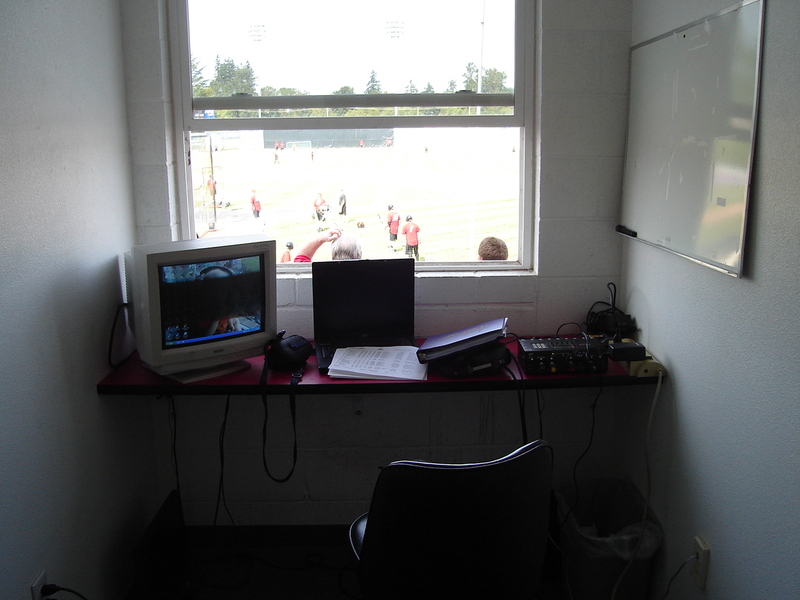 For me, my vantage point (pictured above) is a small booth – but the window makes it tough to see. Tomorrow will see the first team lift on the road – which I will be attending…not sure what the staff will make me do? It has been a struggle for many of the Hawks this afternoon, not from the fact that the club is 0-3 to start the 2009 season, but Salem has one of the more difficult eating situations for the team. I like our hotel, the Comfort Suites – a nice room with ample space for me to work during the morning and to be able to file postgame reports, but the ammenities near the hotel are view and far between. You see, there is no eateries on site, in fact, there are no eateries within a half mile radius of the property. A little less than a mile is a lone Denny’s – which one in the NWL will get sick of real quick, and for me, after all of the years, I won’t touch Denny’s (nothing against their food – but when you have had it over and over, it gets old). From Denny’s, there is a Costco, which you have to have a membership to enter – beyond that, it’s another mile or so to Walmart – which has a Subway inside, along with a Panda Express and Taco del Mar near it. 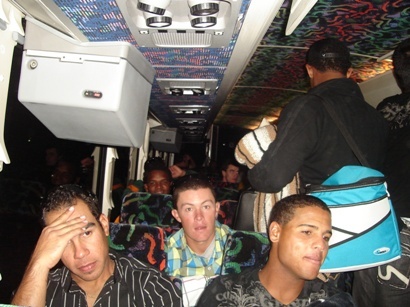 So a three to four mile round trip for food – and a two mile trip after the game at night just for a postgame meal. Not good. What was worse was that without anything within sight of the hotel, it has been difficult for the foreign players to find these spots. Larry Suarez and Robert Hernandez were trying to find the food and I pointed them in the right direction – followed by Jeff Antigua, who as tonight’s starter, will have to make the long walk for food…maybe this is why Salem-Keizer has such a decisive home field advantage. Tri-City is gone and the Hawks are 420 miles down the road. Instead of dwelling on the completion of a three-game sweep by the Tri-City Dust Devils (wasting another solid start, this time a four inning, two-hit stint by 19-year-old Su-Min Jung), we focus on the all-night drive West. It was a pretty typical bus ride – a two movie trip (Taken and Fired Up were the two movies – and kudos to Dan Golden the trainer for stepping up to the plate and going to a Redbox and getting new movies instead of Joe Dirt or Anchorman for the umteenth straight year). Skipper Franklin Font really liked Taken – which had some good action moments, while most of the team missed Fired Up (typical high school movie with football players trying to “mingle” with girls at a cheerleader camp). Once again at 5:30 a.m. 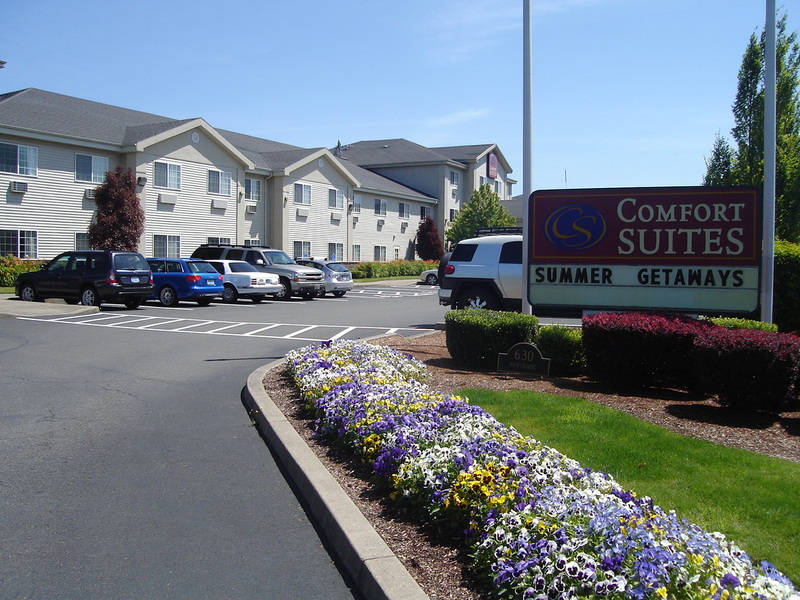 I stepped up to the plate and helped Hal our bus driver find the Comfort Suites here in Salem – since there are two hotels of the same name within a mile and a half. Tonight will be a big night for me, as it is my 300th Northwest League broadcast – not a bad milestone and ranks third all-time in Hawks history behind Rob Simpson and Dave Hahn. We’ll have more later today from Volcanoes Stadium as you get a few of what I see from the booth (that is, if my photos will load).